Why do superstars like and Bon Jovi, Britney Spears, Maddona and Ricky Martin, to an increasing extent choose Swedish composers and producers in an industry characterized by extremely fierce international competition? Bergen, Copenhagen, Dublin, London, Los Angeles, Manchester, New York, Paris and Seattle are some of the more prominent competitors to the Swedish – particularly Stockholm – music clusters. What triggered this evolution and which dynamic forces have been decisive in the creation of the Stockholm cluster? Despite the impressive research presented on spatial issues in the last decade, we know surprisingly little about the forces initiating the creation of clusters. Economic geography models originating in the international trade theory literature, view agglomeration as a function of linkages (pecuniary and non-pecuniary), trade costs and scale economies (Krugman 1991; Venables 1996; Fuijita et al. 1996; Braunerhjelm et al. 2000a,b). Still, the focus is rather on the re-location of already existing economic activities than the emergence of new clusters. New constellations of existing clusters that appear as altered trade costs (e.g. due to an integration process) induce a re-shuffling of firms and factors of production, leading to a new pattern of spatial distribution of economic activities. 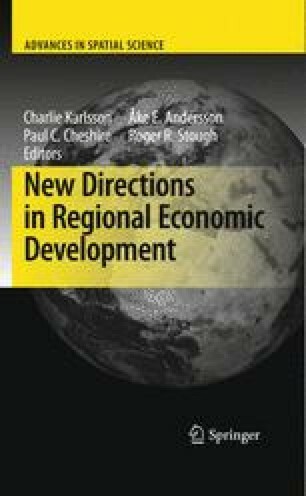 Notwithstanding that these models constitute a true contribution to our understanding of the spatial dimensions of economic activities. Empirical observations also suggest that clusters emerge for quite different reasons, such as exogenous shocks attributed to technological breakthroughs, locational specific factors, historically random events, deregulation, market structure and down-sizing of the government, or the disinvestment of a dominating firm (David 1985; Scott and Storper 1986; Arthur et al. 1987; Arthur 1989; Krugman 1991; Feldman and Francis 2002; Scott 2003; Braunerhjelm and Feldman 2006). Constructive comments from David Audretsch, Magnus Henrekson and participants at a seminar held at Indiana University, have helped to improve the manuscript. Financial support from Vinnova is gratefully acknowledged. Educational institutions – Principal Gunilla von Bahr at the Royal College of Music, Stockholm (KMH), Deputy Rectors Marie Linde and Gunnar Andersson, in charge of musical studies at Södra Latins Musikgymnasium (public high school), Principal Johanna Österling at Rytmus Musikgymnasium (private high school) 29 29 and the head of the cultural schools (primary and secondary level), Hans Skoglund at Stockholms Stads Kulturskola. Record companies – President Niklas Nyman at Music Network (MNW), Vice President Eric Hasselqvist at Stockholm Records and President Per Sundin at Sony Music Nordic.